Every day can be a great day when you start with the Word! Let Germaine Copeland, author of the bestselling series, Prayers That Avail Much, start your day off on the right track. 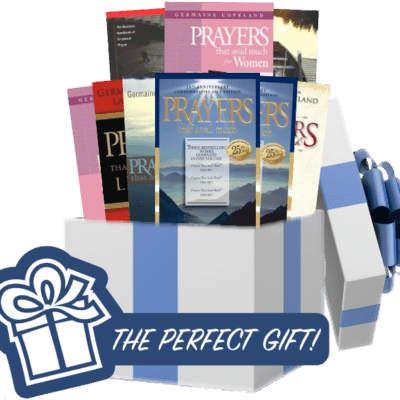 This prayer devotional/journal, designed for the individual who leads a busy life, will allow you to pray powerful, scriptural prayers according to God’s will and see amazing results. With a prayer, scripture, and confession for every day of the year, this devotional/journal provides the opportunity to experience the amazing and life-transforming power of praying God’s best over your life! This devotional delivers more than I expected! 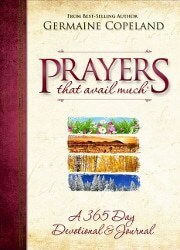 Each page is identified with the date (daily prayer for day of the year) but it is not specific to a year. Every prayer includes scripture references. In addition, there is a daily confession. At the bottom of each page is an area for the reader to write their personal thoughts or plans for the day. The book is a spiral bound softcover that has a Velcro closure to protect the pages. This is for a person who needs to maximize their prayer time and have an outline and everything all in one place. Prayers that avail much. I am waiting for the first of the year to start this devotional but I was very satisfied with it. I am trully enjoying this 365 Day Devotional and Journal, it’s amazing how each day the message seems to be alined with where I am at this time in my life. I’m so thankful for this guidance. 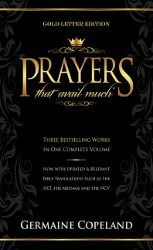 This prayer book just like all other prayers that avail much prayer books is a must have for each home. You can’t go wrong with starting your day right with the life giving words in this book.